This workshop will guide you on a social media educational journey! Covering LinkedIn, Instagram and Facebook, this workshop is beneficial for any professional or business owner looking to expand their knowledge in order to grow their network. We start with an introduction to these three social media platforms, then provide best practices and strategies that you can apply immediately during the workshop. You’ll learn how to use the platforms to grow your business, including content curation and social networking techniques. You’ll also receive a sample content calendar to jump start your social media feeds! We will be hosting this workshop at three different times on June 21st, please register for the time that you’ll be attending. 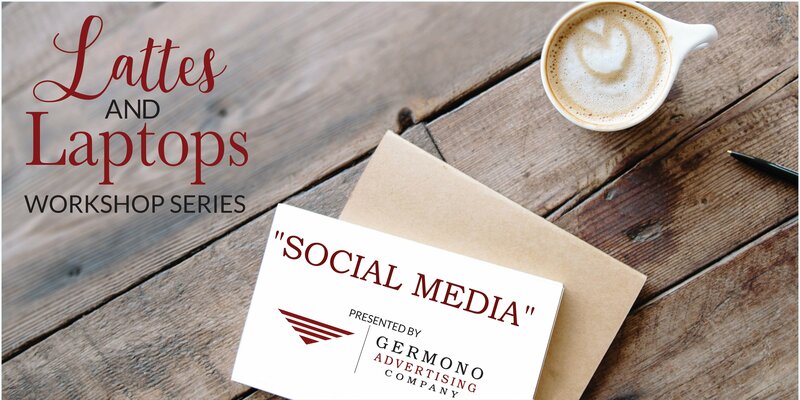 Lattes & Laptops is a small-group workshop series led by Germono Advertising Company. Designed with the working professional/entrepreneur in mind, this educational series has been administered along the East Coast and provides strategies to immediately help business owners and professionals. While there are networking components, this is NOT a networking group. Space is limited to provide personal attention to all attendees in a casual, yet professional environment. Light snacks and beverages will be provided. Attendees are strongly encouraged to bring computers and mobile devices to use during the workshop. Don’t forget your business cards! A $240 value, tickets for this workshop are just $23.00. Ticket price includes training session, workshop materials, 30 day sample social media content suggestions, and refreshments. Each workshop will cap at 15 attendees; therefore, your RSVP is required and will secure your slot. All of our workshops have sold out, so please don’t delay. For sold out time slots, we will establish a waitlist and contact you should a spot open up.